In this article, you will find out why Amity Tours is more than just an inbound tour operator. Moreover, you will understand why our core values will make your trip to Chile an unforgettable travel experience! Amity Tours is a Travel Company based in Pucón. Since 2003, we specialize in travel experiences in Chile such as hiking, trekking, skiing and cycling. More than just a simple trip to Chile, we pledge all our clients to make the best of their holiday when visiting this amazing and fascinating country. We are an adventure travel company and we understand “adventure” as and experience where culture and nature are the main pillars. We specialized in sport activities such as biking, hiking, and skiing, but we also understand that that comes with excellent service, comfortable hotels and great local food, wine and beer. Adventure is a key concept when defining and creating our trips in Chile and Argentina. Active explorations in remote areas surrounded by nature will free our visitors to become part of the place. Adventure trips by Amity Tours will unfold meaningful experiences that will make our guests return home with enormous vitality. By bike, ski or foot we will enable our guests to discover and explore hidden corners, meet local communities and immerse themselves in the life of the Atacama Desert, Lake & Volcano District and Patagonia. We have created unforgettable biking, hiking, skiing and conservation adventures. For instance, imagine yourself cycling Chile’s southern backroads, or discover a beautiful Geopark with pristine lakes and rivers. In addition to share with local indigenous communities while learning about their ancestral knowledge. Moreover, you will envision yourself and your family or friends hiking through Chile’s most impressive sights. Throughout the territory, the variety of landscape will totally fascinate you. Mainly composed by ancient forests, glaciers, fjords, rivers, old shepherd trails, huge dunes, salt flats, lakes, etc. On the other hand, the local fauna will definitely impress you. With species like flamingos, vicuñas, condors, foxes, guanacos, pumas and endemic birds inhabiting the forests. What’s more, if you love skiing or snowboarding, visualize yourself slowing down and speeding up at will, controlling your descent on ice, knowing how to cope with fresh snow, handling uncrowded slopes and narrow paths in the most beautiful ski centers of Chile and Argentina. 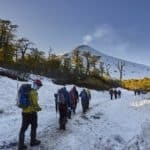 You can ski on and off piste surrounded by Nothofagus forests and active volcanoes in the South of Chile. We believe that experiencing adventures trips will enhance your attachment to nature and enhance your world view. Travel actively with Amity Tours and feel your body in motion while experiencing a fun cultural exchange. You’ll find a true friend in our experienced and professional team of guides and drivers. They will show you the best of Chile and Argentina. You’ll get to know our country and meet local people at every destination. 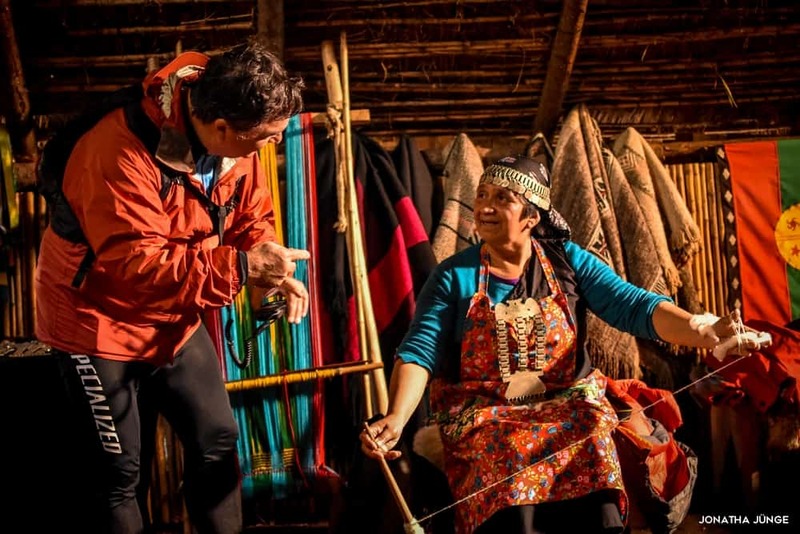 More than a commitment made to our travelers, it is also a conservation mission for us to help the local and indigenous communities present in the Chilean territory. Below, we’ll explain a typical and social experience we give our travelers during their trip. Last week, we experienced a fantastic Conservation trip within the Mapuche Communities in Curarrehue. Twenty-three students from Atlanta, Georgia met with the communities and learned about their ancestral traditions and activities. Upon our arrival at Curarrehue, it was raining. So, the community members were waiting for us inside their Ruka (Traditional House) with a big and warm bonfire. Then, Ms. Regina started explain to us about the Mapuche cosmovision and their ancestral knowledge. She sang a traditional song, and after one of the students shared with all of us one of her own songs. After this beautiful exchange, the students enjoyed a Palín (Traditional game) workshop. Finally, we shared dinner with the community around the fire. The next day, we had breakfast at Ms. Juanita’s place. We tried different dishes prepared with ingredients from her orchard and fruit trees. Sopaipillas, calzones rotos, wheat coffee, mate (a strong green tea traditionally drunk in Chile and Argentina), marmalades and jams, bread, cheese, free range eggs and fruits were some of what she served. Then, we visit her organic orchard and continued our adventure to the Ralicura trail. Our Mapuche guide took us through a native forest and we were able to learn more about their belief in nature as a sacred place. After hiking 40 minutes, we arrived to a view point where we enjoyed incredible views of the Ruka Pillan volcano and the Trapial Lake. During the afternoon we learned how to prepare tortillas al rescoldo and how to weave in a traditional loom as well as with vegetal fibers beside the river surrounded by trees. At Amity Tours, we believe that contact with people and local communities can be life changing. These types of activities make our trips unforgettable experiences. Hopefully, they will remain in the minds and hearts of our guests forever. The best part is how blessed we consider ourselves to be in a country with amazing nature. We’ll make sure you see the best of it, and discover the hidden corners that will make you hold your breath in awe. Nature, as a concept, has been socially constructed as an object and a subject providing people with meaningful experiences. Accordingly, leisure activities in nature will enhance the interaction between people and the natural environment, and will increase their attachment to it. People will become more conscious about conservation of protected areas and will be more sustainable in the way they travel. In Amity Tours, we have been developing nature-based experiences in Chile and Argentina since 2003. Each of our trips has been planned with the idea of providing tranquility and spiritual wellbeing to our travelers. By walking and hiking through a native forest, kayaking in pristine lakes and rivers, biking through rolling hills and skiing in active volcanoes… We provide significant and invaluable memories to our guests. Some of our most popular trips occur in the Lake & Volcano district in Chile. This area has been labeled a Biosphere Reserve by UNESCO. National Parks such as Conguillio, Villarrica, Huerquehue, Alerce Costero, and Vicente Perez Rosales, etc. They all are stages for our trips providing hiking and biking trails to develop the aforementioned experiences. Please share this article if you identified yourself in our core values! And don’t hesitate to contact us if you’d like to have an unforgettable trip in our beautiful Chile!